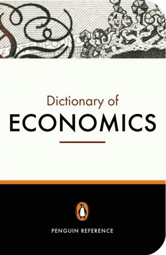 The Penguin Dictionary of Economics explains a host of economic terms, from acceleration principle to venture capital, Euro to X-efficiency, globalisation to zero-sum game. The seventh edition has been fully revised and updated to include those terms that have become so familiar since the global recession begun ('quantitative easing' and 'sub-prime' among them), but whose meanings escape most of us. Wide-ranging and accessible, this detailed practical and international guide will be indispensable for students of economics and professionals (in business, finance or the public sector), and for anyone wishing to follow economic discussions in the media today.